Do you often confuse what and which? Fear not! Tom's here to tell you which is which! Give us 60 seconds and we'll give you the English! Hello again, everyone. Tom here for BBC Learning English. 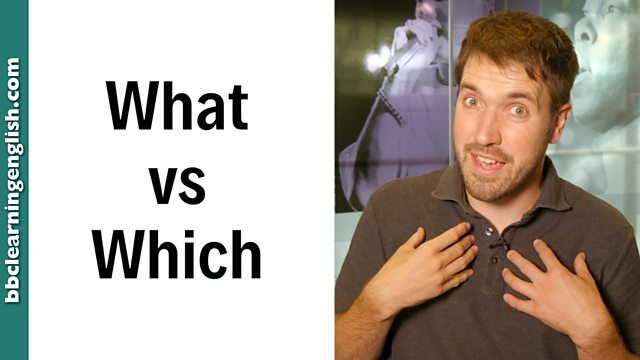 Today, I'm going to explain the difference between what and which in questions. What is used to ask a question which has a lot of possible answers. Consider the question: What do you want to eat for lunch? Here, there are no choices to limit your reply. You could choose anything you want. We use which when we have options to choose from. So, here we have two choices – a sandwich and a melon. So I can say: Which do you want to eat? The sandwich or the melon? Now, next time you need to ask a question, you'll know which word to use. What for anything and which when you have a choice. What and which are question words like who, where, when and why. What is used to ask a question with a lot of possible answers. The person answering the question does not need to limit their reply. They can choose anything they can think of. Which is used when there are a limited number of answers to the question. This is often obvious from the context. Which do you want to eat? The sandwich or the melon? We can go to France, Spain or Portugal. Which would you like? I'm free at 12pm or 3pm. Which time should we meet at? If you can't make a question with it, it isn't a question word! Which of these is not a question word? Do we use 'what' for a limited number or 'which'? Are there a limited number of options?